| New York, NY - November 29, 2018 | Fil Doux Textiles introduces Coast to Coast, an upholstery collection that is inspired by treasured destinations from around the world. 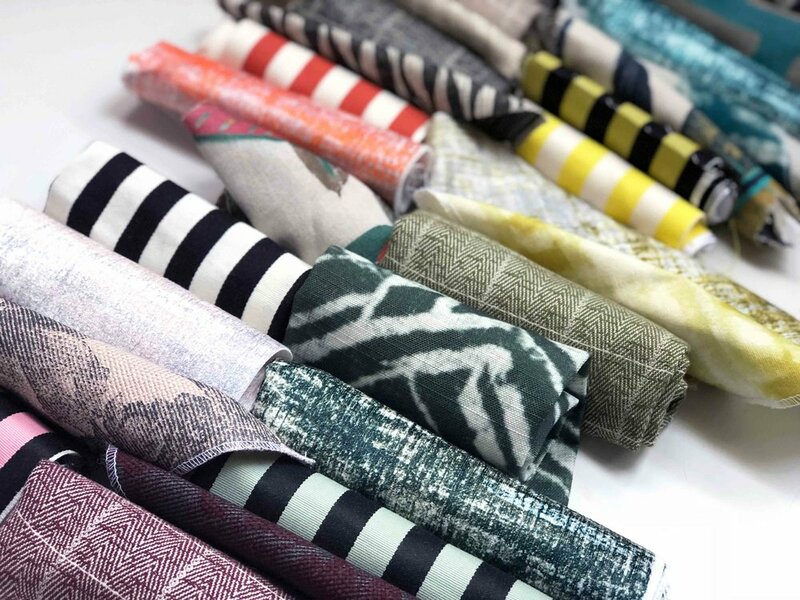 Bold and vibrant, the collection consists of 12 patterns in over 50 colors and boasts an impressive range of woven textiles made from Fil Doux Textiles’ proprietary Experience Blend, a yarn with a unique composition of 20% cotton wrapped around a strong 80% polyester core. Each pattern encapsulates the unique attributes of its namesake location. Fil Doux Textiles’ vertical business model influenced some of the collection, with the location of their mills in Chile and Brazil acting as a source of inspiration, as well as their headquarters in New York City. Presented in a palette of nuanced and breathtaking colorways, several of the patterns are also offered as drapery options. Ipanema: Ipanema is an homage to the iconic boardwalks in Brazil! Inspiring artists and tourists from around the world, the company translated love for the beautiful destination into this design. Irving: In London, Irving St. mills with well-dressed, influential people in the heart of the UK’s biggest metropolitan area. Taking this into account, Fil Doux Textiles referenced men’s suiting in every step of the creation of this handsome, tailored pattern. Irving is available in 5 classic colors. Kahala: The Kahala neighborhood on Oahu is a destination known for its brilliant seaside views and a focus on wellness, located inside Hawaii’s capital city of Honolulu. The aerial view of the winding streets prompted a laid-back, intricate digital print, available in 3 colors that are perfect for pillow accents or show-stopping drapery. Marin: The coastal colors of Northern California gave life to this digital print, coming in 11 breathtaking tonal combinations. The bold layered shades are mesmerizing in combination with subtle hues, the pattern hinting at namesake region’s waterfront sunsets. Mendoza: A nod to the heart of Argentina’s wine country, Mendoza’s soft woven hand suggests the beautiful, organic cloud patterns found flanking the countryside. The woven pattern is launched in 5 eye-catching colors, and is available as drapery or upholstery. Nantucket: This chevron pattern is the perfect homage to one of the most treasured East Coast destinations; Nantucket. With its romantic sand dunes and nautical vibes, Nantucket is a mix of crisp traditional style and a relaxed seaside atmosphere. Olympia: Inspired by the tranquil yet mysterious fog familiar to the vast terrain of Olympia, Washington, this digital ombré offers a contemporary touch to any design. The pattern is available in Indigo, Forest, and Mist. Orleans: Iconic and recognizable with a classic comfort, Orleans is a striped pattern with a dual construction. The design exudes a subtle richness, complimented by 11 playful color options. Villanueva: Big, bold and bright, Villanueva makes for a grand entrance in any space. Expressive in every way possible, all 6 colorways pack a punch in this woven dynamo. Woodstock: Taking cues from both the ancient Japanese Shibori dyeing technique and the beautiful American tie-dye process, Woodstock is a funky, earthy and slightly psychedelic digital print. A company favorite, the design is back in 6 fresh colors; Grey, Mustard, Turquoise, Indigo, Brown, and Burnt Orange. Coast to Coast will debut at Boutique Design New York 2018 at Fil Doux Textiles’ inviting, custom designed booth (#1257). The company’s executives Leo Novik and Robert Pullen, as well as Creative Director Audrey Pincus, will be attending the show. Email fildouxtextiles@fogandapple.com to set up an appointment with a member of their team.